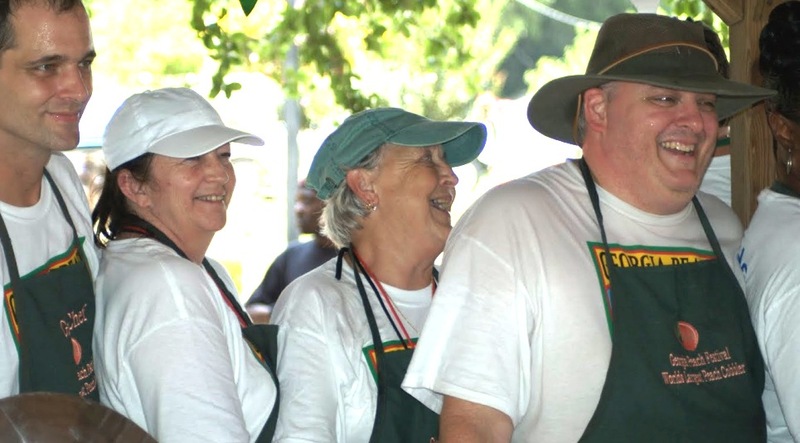 While the rest of us lie asleep in our beds on a Saturday morning every June, Rich Bennett and his cohorts slave away on Peach County's renowned culinary masterpiece: The "World's Largest Peach Cobbler." And by 2 o'clock on the final Saturday afternoon of the Georgia Peach Festival , a substantial crowd will have already begun to line up for a taste, an annual event many consider to be the most anticipated highlight of the Georgia Peach Festival. Beginning with the festival's return in the 1980s, a county commissioner has traditionally headed the task of baking the marvel. In 2004 commissioners appointed Bennett, the county's information systems manager, to the celebrated job. He and the other county employees convene at 4 a.m. on the final Saturday of the Peach Festival in Fort Valley, Ga., to begin their work on the yearly project, which takes roughly five hours to complete. For the next several hours, after the baking process ends, the cobbler will cool until it is ready to serve the masses. The colossal cobbler -- 11 by 5 feet and about eight inches deep -- is made from an extraordinary 90 pounds of butter, 150 pounds of sugar, 150 pounds of flour, 32 gallons of milk and, of course, 75 gallons of peaches courtesy of Lane Packing Co. The cobbler's other ingredients are purchased by local sponors. The giant cobbler is prepared in a brick oven located in the parking lot of the Peach County Courthouse, which was constructed especially for the cobbler. For a baking pan, the chefs utilize school bus floor panels donated by Blue Bird Corp.
Bennett said the arduous process begins with dividing the ingredients into five work stations manned by six to eight people. Everything is mixed in large plastic tubs and stirred with boat paddles. Since taking on the job, Bennett has incorporated his own fresh techniques in preparing the giant cobbler, all aimed at making the cobbler better. "I consulted a professional baker for some suggestions to improve the taste and make the crust less gooey," he said. "And I'm always tinkering with the burner, it's always evolving. 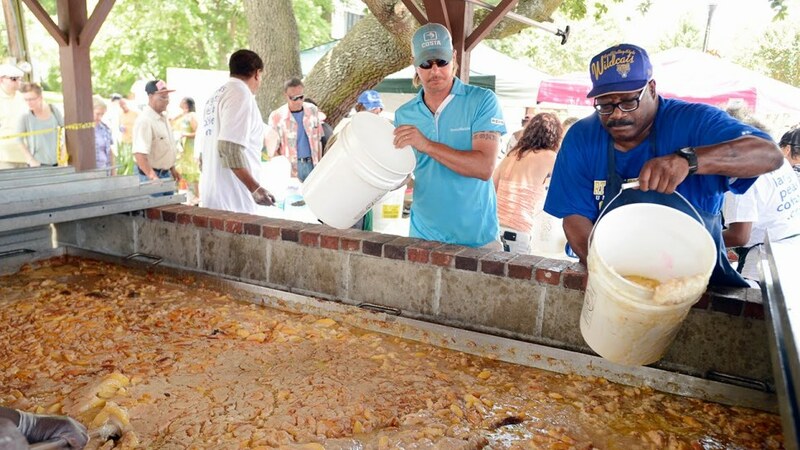 Most people say the cobbler gets better every year.."
If you feel the urge to try to duplicate the World's Largest Peach Cobbler at home, here is the recipe. But from experience, we suggest this undertaking be left to the professionals. Below this recipe is another great recipe for a cobbler you can make at home. Divide self-rising flour, sugar and milk into six equal parts and pour into six clean trashcans. Mix thoroughly with clean boat paddle. Sizzle 90 pounds of butter in a 5 ft. x 11 ft. baking pan six inches deep. Pour in batter then add 75 gallons of sliced peaches. Bake at 350 degrees for about four hours until golden brown. If you can’t get fresh or fresh frozen peaches, you better be prepared to open a lot of giant cans of peaches. Pre-heat oven to 350 degrees. Mix together 1 cup self- rising flour, 1 cup sugar and 1 cup milk. Melt butter in microwave oven and pour into empty disposable baking pan. Be sure butter is sizzling and then add batter mixture and top with fresh peaches. Bake 25 to 30 minutes in the pre-heated oven until golden brown. If you can’t get fresh or fresh frozen peaches, use one large can of Georgia peaches.